You've no doubt heard that saying about a wolf in sheep's clothing. That's an apt description of the 2014 Audi S8, a large performance sedan with the numbers and speed to satisfy the most power-hungry of drivers, even as it goes unnoticed by the uninitiated. Besides some subtle badging and bodywork, the S8 could easily be mistaken for Audi's luxurious -- and already quite anonymous -- A8 flagship upon which it is based. While the A8 luxury sedan is an impressive performer in its own right, the Audi S8 pushes the performance needle toward 11 by adding a second turbocharger to the A8's 4.0-liter V8. The result is a sharp power jump from 420 horsepower to 520. By Audi's reckoning, that's enough to propel the S8 to 60 mph in an impressively quick 3.9 seconds. Fortunately, all of this fanfare doesn't come at the expense of efficiency, as the S8 still earns an impressive 19 mpg combined fuel economy rating. Luxury and comfort don't suffer for the added performance either. As expected, the S8 benefits from a crypt-quiet cabin, even at Autobahn-storming speeds. Interior materials and design are also excellent, and myriad electronic systems make it one of the most technologically advanced vehicles available. Rivals at this level are understandably scarce and definitely worth considering alongside the 2014 Audi S8. The Jaguar XJR is priced similarly to the Audi, while the Mercedes-Benz S63 AMG and Porsche Panamera Turbo are typically more expensive. Among these fine choices, though, the Audi S8 represents one of the best ways to fly under the radar -- at incredibly high speeds. The 2014 Audi S8 is a high-performance full-size luxury sedan that is offered in one well-appointed trim level. Unlike the A8 on which it is based, the S8 does not offer the option of a longer-wheelbase variant. Standard features include 21-inch alloy wheels, summer tires, a sport-tuned adaptive air suspension, LED headlights, automatic high beam control, a top-view camera, front and rear parking sensors, a sunroof, auto-dimming and power-folding mirrors, a power trunk lid, soft-close power doors, keyless ignition and entry, diamond-stitched leather upholstery, four-zone automatic climate control, 22-way multicontour front seats (with massage functions), heating and ventilation for the front seats, a power tilt-and-telescoping steering wheel and power rear side and rear-window sunshades. Electronic features include a navigation system, Audi's MMI electronics interface, an 8-inch central display, Bluetooth phone and audio connectivity, and a 14-speaker Bose surround-sound audio system with a CD player, satellite radio and an iPod interface. Also included are Audi Connect (enhanced Web-based navigation, information and WiFi access), a blind-spot monitor and a rear collision alert system. Options include a number of packages. The Cold Weather package includes a heated steering wheel, heated rear seats and a rear-seat pass-through with ski bag. The Driver Assistance package features adaptive cruise control with a frontal collision-mitigation system. The Lane Assist package adds a lane-departure warning system and a four-spoke steering wheel. Individual option highlights include different wheel designs, a solar sunroof (powers a ventilation fan to keep the car cool), a rear seat entertainment system (with dual screens), night vision assist and a 19-speaker Bang & Olufsen surround-sound audio system. 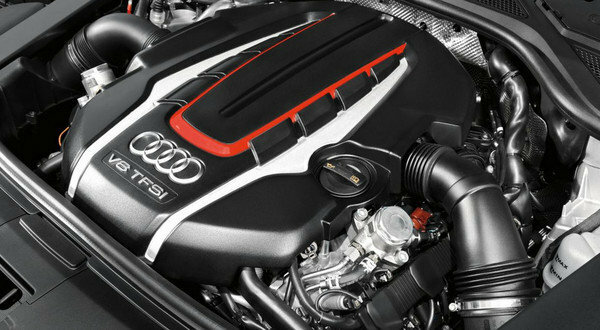 Powering the 2014 Audi S8 is a twin-turbocharged 4.0-liter V8 that produces 520 hp and 479 pound-feet of torque. An eight-speed automatic transmission drives all four wheels through a standard all-wheel-drive system. Audi claims the S8 can sprint from zero to 60 mph 3.9 seconds, which is even quicker than the company's speedy R8 exotic sports car. The EPA estimates fuel economy at 19 mpg combined (15 mpg city/26 mpg highway). Standard safety features for the 2014 Audi S8 include antilock disc brakes, stability control, front and rear parking sensors, a top-view camera, blind-spot monitoring, rear collision alert (warns of potential rear collisions and engages certain passenger protection features), front-seat side airbags, rear-seat side airbags, full-length side curtain airbags and front knee airbags. Optional is a frontal collision-mitigation system that monitors traffic and alerts the driver if a potential collision is detected, then applies the brakes (to a standstill when vehicle speed is below 20 mph) if a collision seems imminent and the driver hasn't reacted. A lane departure warning system and a night-vision camera are also available. Based on the A8 sedan, the Audi S8's cabin benefits from a thoroughly modern and understated design. Top-grade materials meet up with expert craftsmanship and assembly in one of the finest interiors in the automotive world. Seat comfort is exceptional, thanks to 22-way-adjustable front seats with numerous massage functions that ensure drivers of all sizes will find a comfortable position. Rear-seat passengers won't feel left out either, as there's a wealth of head- and legroom for taller adults. Audi's MMI interface should be a hit with technophiles, as it controls a multitude of functions. The menus take a little getting used to, but once you're acclimated, even more complicated tasks can be executed with ease. Also included is a remote touchpad that allows users to trace letters with their fingertips to input or find phone, music or navigation data. Some may recoil from the price of the premium Bang & Olufsen surround-sound system, but audiophiles will likely agree that it is one of the finest audio systems on the market. The one glaring fault in the S8 is its surprising lack of trunk space. At a paltry 13.2 cubic feet, the cargo capacity is less than that of many compact sedans and not nearly adequate to accommodate luggage for four adults. There's no question here about speed, as the 2014 Audi S8 is blindingly quick. The Audi's turbocharged V8 spools up to speed so quickly that you almost forget it's a forced-induction power plant. The eight-speed automatic transmission heightens the effect by quickly and seamlessly cycling through the ratios. We also like the electronically adjustable settings for the chassis and engine calibration, as they provide a useful degree of driver customization. With its all-wheel drive, well-tuned suspension and crisp steering response, the S8 handles like a smaller, lighter sport sedan. It's only around truly tight turns that you'll be reminded of the car's substantial size and weight. In low-speed city traffic, the standard air suspension's ability to filter out harshness borders on magical, considering the Audi S8 wears low-profile, 21-inch summer performance tires. In Comfort mode, you'll easily be fooled into thinking that you're driving a regular A8.